Shedding, Shedding, Shedding! What should I do ? There are two big mistakes people usually make when using minoxidil hair loss products. Very often I receive questions asking why I do not recommend minoxidil sulfate in a hair regrowth product. 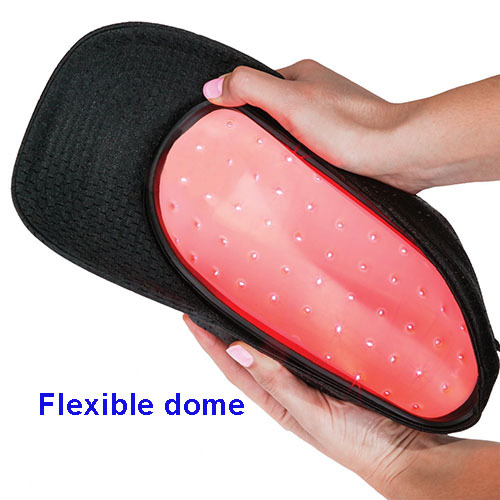 This review is for Capillus 82 Mobile Laser Therapy Cap. As Low Level Laser Therapy device for hair loss treatment, Capillus is no different from other brands like iRestore, Theradome and HairMax in the following several aspects: (a) how it works; (b) the suitable hair loss it can treat; (c) the skin type it may work (yes, not all skin will work) ; (d) and safety. Nonetheless, it is quite unique in several aspects which are explained in the following sections. 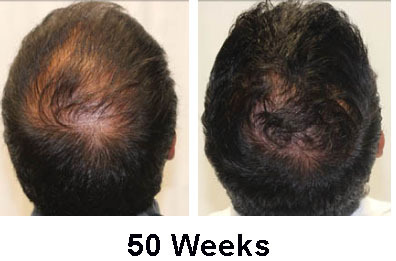 What is the Capillus Laser Hair Growth System? Capillus is an FDA-cleared (not FDA approved) laser hair therapy system for androgenic alopecia (male or female pattern baldness). Capillus laser therapy caps use safe, low level lasers to energize hair follicles and spur new, natural hair growth. 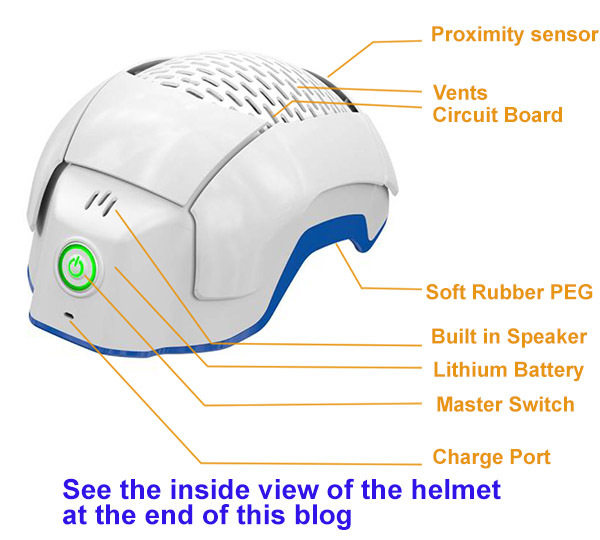 Different from other LLLT device that are more like “helmet”, Capillus is more like a hat (see above the main image of this blog). The main device consists of a detachable hat with Capillus logo and an inner dome. The laser diode boards are mounted inside the dome (see the image at the end of this blog). There is a clear plastic shied to cover the laser diode board to prevent the diodes from contacting hair directly when the cap is worn. The latest version of Capillus has a patent-pending flexible dome design (see below). Capillus has three different models: Capillus82, Capillus202, and Capillus272pro. The difference of the three models mainly lies in the number of number of diodes. The warranty is also different. The price seems to be proportional to the number of diodes. It is approximately $10 per diode, which is low compared to other brands. See the comparison below. Capillus works only for genetic hair loss (androgenic alopecia, or pattern hair loss). 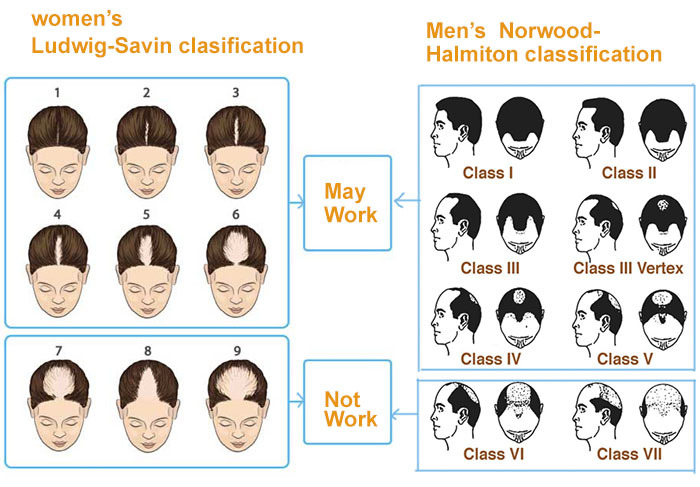 Even with the genetic hair loss, it only intends for men between the age range of 18-48 (Norwood-Hamilton Scale between Class IIa to V )and women between 18-60 years who are suffering from hair loss (Ludwig Savin Scale between Class I to II ) (see image below). The skin type Capillus may work is Fitzpatrick Skin Types I to VI as indicated below. Worth noting that it works better for light skin than dark skin. Presumably the dark skin obstacle the penetration of laser light and makes it less effective or ineffective at all. The hat, when worn appropriately on the head and switched on, emits a red light, which is then absorbed by your cells. The light energy absorbed stimulates a rapid change in the metabolism rate and ATP production of the cells. This causes the hair follicles that have long been dormant to start producing hair again. Results is said to be visible at the beginning of 17 weeks. What is included in Capillus package? How is Capillus compared to other laser helmets? *: Capillus is a cap like laser helmet. The size of the cap can’t be adjusted to fit heads of different size. However, it offers two sizes of the cap, one for average size of head and one for larger head. **: Capillus and Igrow provide wall plugs that look similar to what is shown below. 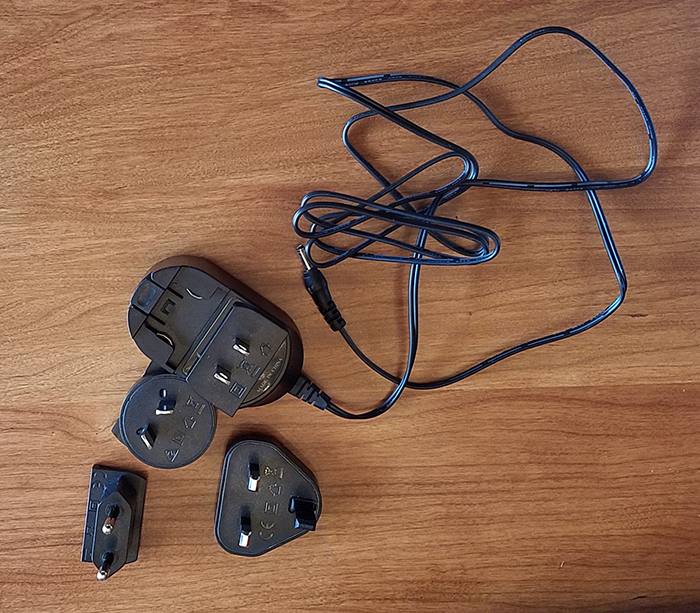 It includes changeable plug prongs so it can be used in most countries in the world. The AC adaptor of all four brands above can be used with voltage from 100 v to 240v. ***: Capillus has two other versions Capillus202, and Capillus272Pro. How to use Capillus Laser Therapy Cap? User is supposed to wear Capillus cap every day, 6 minutes a day. All you have to do is put it on your head, press the power button to turn on the cap. The cap is light and convenient to wear. The laser and LED lights turn off after 6 minutes. 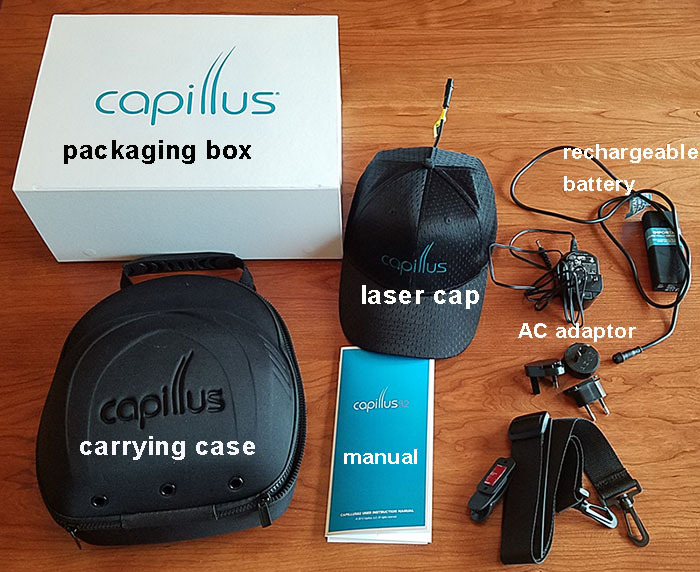 Capillus cap has proximity sensors for your safety consideration. It automatically turns off if you ever need to take off the cap in the middle of the treatment. Continuous to use of the device is needed to keep the results. It is interesting to see that the Capillus requires user to wear it every day. When it was initially launched, users were only required to use 2-3 times a week with 20 minutes each time which was the same as other brands like iRestore and Theradome . Not sure if Capillus is forced to cut down the treatment time each time and increase the number of treatment due to the intrinsic issue of its design. Compared to other brands, the ventilation of Capillus seems to be less efficient, which may results in over-heating of the device and shorten the life span of the laser diodes. Personally, I prefer to use it 2 to 3 times a week (20 minutes each time). Capillus is generally believed to be free of any side side effects except for some complaint of scalp itchiness. It very important to make sure your head is free of minoxidil or any other hair care products when you use Capillus hair laser treatment device. You can still use minoxidil products like Lipogaine and Rogaine as if you were not using the laser helmet. You just need to wash your head and dry it before you use Capilus. It is imperative that you keep the device away from water, wet spots, or anything damp. Also, make sure your hair is dry before using it, and it should be kept away from the reach of children or pets. Avoid looking at the laser light diodes directly when they are on. 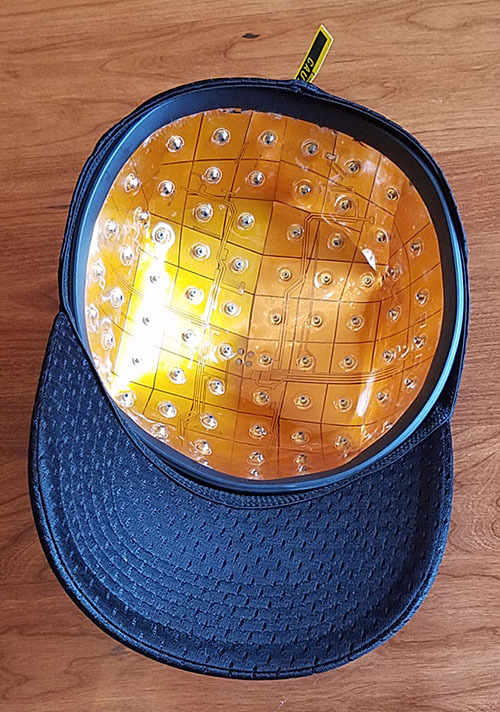 In a small scale clinic study performed by a third party, all subjects noticed improvement after using Capillus laser therapy cap for over 17 weeks. 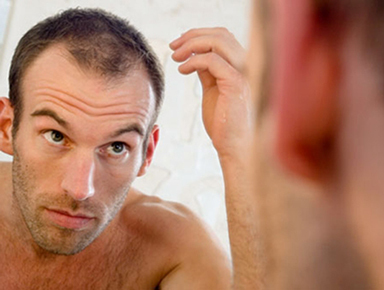 Reduced hair loss was noticed and some were reported to see some hair regrowth. 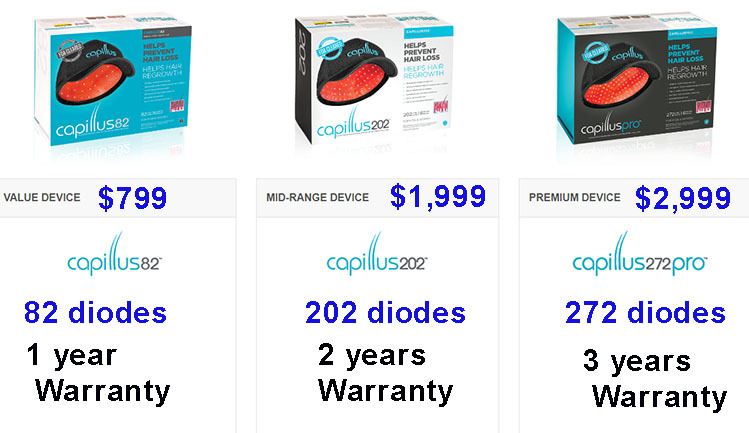 The standard price of Capillus82 laser hair regrowth helmet with a battery is $799.00. Capillus202 is $1999, and Capillus272Pro (prescription only) is $2,999. You can either order it from Amazon or Capillus official website and its liscensed the clinics. 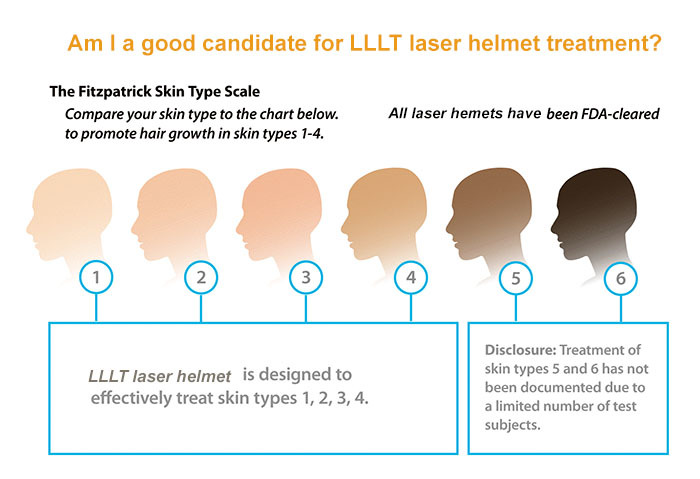 If your hair loss is mild and your main goal is to stop further hair loss, you can try lower level laser therapy (LLLT). However, if your hair loss is in an advanced stage and you want to regrow some of your loss hair, it is better to use FDA approved products like Minoxidil and/or finasteride (instead of FDA cleared LLLT device). If you do decide to try LLLT treatment, Capillus definitely is not a bad choice. You can also consider other similar device like Theradome (requires less frequent use) and iRestore (fewer laser diodes and lower price). Lipogaine Review | What Real Users Say About Lipogaine? @ Copyright 2018 by Minoxidilmax. All Rights Reserved. Do not buy! Save your money! FYI, I’m using a fake name to hide my identity. I initially made an appointment with a reputable hair transplant surgeon to discuss a hair transplant via the ARTAS procedure but they told me I needed to stop any further hair loss before going through with the procedure. I bought this through the surgeons office for $3,000 in 2015 as an alternative to Minoxidil and Finasteride. The risk for me was that there were no returns but instead I had a 5 year warranty. I was so desperate for a solution I took the risk but knew in the back of my mind I could be making a real dumb decision. They said at worst it would halt any further hair loss. After the first year using it exactly as prescribed, I had no improvement but couldn’t tell it was any worse. It was very disappointing but wasn’t surprised. After 2 more years of use, I’ve noticed my hair loss has progressed further with my hairline, crown and overall density. It’s been very depressing looking back at photos of when I first started and where I’m at now. The fit of the cap is extremely uncomfortable and feels like it will pop off your head. It will also give you headaches from time to time due to how tight it fits the sides of your head (temple area). I bought the largest size and still doesn’t fit right. You think for a $3,000 price tag they’d custom make your cap. Money was tight, so I didn’t go back to see the surgeon after year 1 to see if I was still a candidate for a hair transplant procedure. And when I do get enough money, I will not go back to them. I have no idea how this was FDA approved and Capillus laser caps are a scam preying on people like me desperate for stopping hair loss. There should be a class action lawsuit against them. Guys like me are facing a double edge sword, either take on the risk of the efficacy of the laser cap or take a Finasteride/Minoxidil and risk side effects. Buyer Beware! No results and false promises.. is NOT satisfaction guaranteed.. tried to return and said you had to wait 6 months, and then after 6 months said I waited too long, only have a window of a matter of weeks allow returns.. and then find out in the fine print it is only 75% of purchase… lies and deceptions!! I have used Capillus for 12 months without any improvements. I’ve followed the directions from the Capillus representative and my doctor. My doctor recommended the Capillus and I purchased it from him. I have been hearing great reviews on iRestore Laser, so I will try it out. Here’s the deal – Capillus has a decent marketing team and the doctors make a commission from each unit sold since Capillus partners with other affiliates. This is why your doctor might be recommending you to purchase Capillus through their office rather than other products that are sold online or elsewhere. However, other companies sell there products exclusively by their own company. Do not purchase Capillus! There are better products out there, so look into other products first! Customer service is terrible! I called and on hold for over 20 minutes to speak to the manager, Fernando. I was then told he would call me back as he was busy with other customers. He never called back! I called 3 more times and while friendly, the experience is like amateur hour, small shop with people not even aware of their own product, For the record, I had purchased their 3K unit, so go figure! I’m a stylist and I always recommend Capillus laser to my clients! I haven’t used it personally however a lot of my clients do use it and their results are amazing! This product is worthless… a piece of junk… do NOT waste your money. My husband diligently followed the instructions and actually lost hair during the process. His scalp became extremely sensitive and was told by his dermatologist to stop using it. Have been using it for 6 months and seen zero results. If your reading this, please don’t waste your money like me and many others have on this sham of a product. I’ve used it now for about a year and a half. I’m a 23 year old woman and I started to have some heavy hair loss at 22. It DID stop my hair from falling out to an extent.. But I also did a PRP and stem cell treatment about 3 months after using it. I haven’t really noticed any kind of signifiant regrowth so thats why I’m giving it 4 stars. Also the price is a little ridiculous for what you’re getting but whatever. Hi Jamie, Please stick with your treatments as per indications for use. Keep in mind that androgenetic alopecia is a progressive condition which will worsens over time if there is not intervention. I have been using the Capillus 272 for about two years now. The first six months I was told to expect some increase in shedding, which did happen. This was followed by six months of some very minimal improved growth, although since I had also started a new regiment of Rogaine at the same time, it is unclear whether the regrowth results were due to the affect of the Rogaine or the cap. I have continued with the cap and the Rogaine for another year since, while also on a 1MG prescription for Finasteride, and have seen no improvement in regrowth in this year. In fact, the shedding has worsened, and I now have thinning in areas that I did not have prior to using the cap. In short, this cap has done little to nothing to improve new hair regrowth (as it claims it will), nor has it maintained my existing hair (another claim). My hair started thinning when I was 24 years old. Now I am 49 years old and I can tell you that I have researched female pattern hair loss extensively. Plus, I’ve tried every over the counter and home made remedy I could get my hands on. There are only a handful of solutions that I recommend and this one is at the TOP OF THE LIST. I have the Capillus82 and as soon as I started using it I noticed a difference. That’s not to say that my family noticed a difference because the nuance was small — but that didn’t matter to me. I know from experience that if something is going to work, I will see it happening even if others cannot. I have been using it for 3 months and I have a different head of hair. I use it 4x/week without fail because consistency is king — and the bottom line is I really do want my hair to look good. My battery was a little wonky and I emailed customer service late one Saturday night — and a new one arrived in the mail by Tuesday afternoon. I recommend this product without reserve. You won’t regret spending the cash. Please contact us at (786) 888-6249 to discuss your progress. Please keep in mind that pattern hair loss is progressive in nature. If you are not noticing a change, that in itself is a success because your condition is not getting worse. If left on its own, hair loss due to androgenetic alopecia will worsen over time and is impossible to reverse if deterioration results in death of the follicle. Please take a look at the following page which explains what to expect from Capillus. https://www.capillus.com/what-to-expect/ As long as you use your device as instructed in the manual, 30 minutes very other day, your hair follicles should continue to revitalize from the laser therapy. I have nothing to say but good things about my progress. I have been using the cap for 9 months now and see a tremendous improvement. All of my friends can visibly see the difference. Love the capillus cap and the results. Be patient it takes time. Customer service is right on target. Had to replace 2 batteries without any hassle at all. Seems to me they stand by their product. My hairs seems to be better, my battery was down and ana answered me really fast and even if i am in France, i got a new one just one week after my ask. Really good team, thanks to Ana, and thanks to Yvette. Its now 4 months i used it, i hope it will improve my hair scalp and have new hair regrowth now.. Thank you for your feedback Florent! Please keep us updated on your progress. Don’t be shy to use Capillus! I inherited the hair thinning gene from my mom and always felt it was inevitable that I’d end up close to being bald. As a 53-year old woman, I’ve tried several hair products for hair growth (and have allergies to most of them) and was skeptical about spending thousands of dollars on hair procedures that perhaps wouldn’t work. After much research, including some medical reviews, consumer reports and user reviews, I decided to go ahead and invest in the Capillus hair program. I opted for the least expensive option after being told by the wonderful Capillus staff that I could upgrade to another model by trading in my model and paying the difference (within a reasonable time, of course). At most, I expected to have the prevention of additional hair loss by using Capillus. I took a photo on day one and now, six months later, took more photos. Well, I can tell you that my results have far exceeded my expectations. I definitely see actual hair regrowth in my photos! AND – I’m a person that uses keratin to straighten my hair four times a year and also colors my hair (I went from black to red). I couldn’t be happier with these six-month results and look forward to the next six months! How do I use Capillus? It’s like wearing a lightweight baseball helmet for 30-minutes, three to four times a week. I do it while watching TV or having dinner. It’s mobile – the battery pack can be tucked into a pocket and you can move around. About once a week, I recharge the battery and I’m good! Capillus also offers four hair products to maximize the hair treatment. I really love the shampoo and conditioner. There is also an activator and revitalizer – but honestly, I haven’t used these two products consistently only because I’m always in a hurry. So my bottom line is – don’t be shy about using Capillus! Be patient, use it consistently and experience the results. Thanks so much for your positive feedback! It is great to hear from those benefitting from our laser therapy caps! 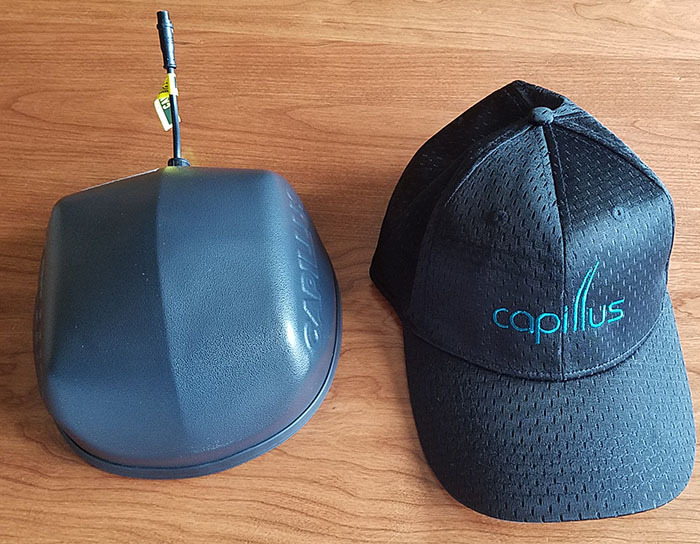 I purchased my Capillus laser cap by phone with Capillus almost a year ago when a friend recommended it because her hair restoration surgeon had recommended it for her. Now my hair is so much fuller! I had been super depressed because I kept seeing more empty areas of my scalp in the mirror. I started using the Capillus laser and my hair is full again. I don’t have to worry about the part anymore. I wear it every other day while I watch the evening news. It’s so easy to use. I will never stop! Thanks Alicia! Happy to hear. Please share any before & after images you may have with us on our website at www.capillus.com. You can also take a look at all the new products we have added since you purchased your cap. I have been using the Capillus cap for 6 months and do not see any results. I have been very regular, just missing a night here and there and then doing the treatment the next day. I even took it along on a 47 day cruise trip to Australia and New Zealand. I appreciated the international plugs that are included my purchase! I don’t want to give up so I’d like to find out how much longer before most people see results? Thanks for taking the time to provide your feedback. Glad you were able to take advantage of the travel accessories! Compliance is key. If you are using it regularly, be patient… you should begin to notice results soon. Our study results showed improvement in over 95% of active participants with increase in hair counts ranging from 11% to 181% within 17 weeks. Keep in mind that initially the hair will be very short as it takes time for hair to grow. Take a look at what to expect on timing on the following page: www.capillus.com/what-to-expect. We also recommend taking progress photos so you can compare pictures of how you are progressing. Remember that we do guarantee your satisfaction. Please reach out to our customer service team if you have any questions at 786-888-6249. I want to buy the shampoo, conditioner & activator, but the shipping you are charging is so much, around $250 while in other companies if you purchase more than $150 you have free shipping anywhere in the world. I find it disappoint. I was wondering if you have other ways where you can ship anywhere in the world that will cost my shipping more than the products that I want to purchase. Thanks for your feedback. We offer free shipping on any orders over $50 anywhere in the USA because we are based in the USA with manufacturing of our laser devices and clinical hair therapy products here. Please contact customer service at 786-888-6249, Option 2 to check with our fulfillment department to ensure you are getting the best shipping rate. We will consult with our international couriers to ensure we are receiving the best rates we can extend to our customers. I am sorry to hear that your charger was faulty. Please keep in mind that the warranty covers any repairs/replacements necessary on the chargers for a year form purchase. Please reach out to our Customer Service team who can discuss your progress. We also recommend you keep track of your progress (https://www.capillus.com/submit-progress-photos-capillus/). We currently even offer a rebate incentive for submitting progress photos to us. Please check with our customer service team for details. Keep in mind that if after your 6 month evaluation period, if you are still not happy with the results you see, we do offer the option to return your device. If you have any questions, please reach out to our customer service team, at 786-888-6249, Option 3.